Create a crafty Money Box with your children, place it in a popular corner of your home and motivate them to start saving for their first million! Children can help choose the design/ picture for their money box and can help fill in colour once the outline has been drawn by their mother. The final touches of buttons, beads, charms etc can be selected by the child. Children can stick these on once the money box has been completed. The Dala Craft Glue Pen is extremely child friendly to use. 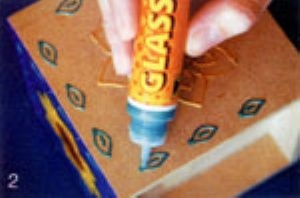 Using Dala Glass Artliners, draw the outline of the design, using different colours. Choose a neutral colour and outline the sides of the box so that background colour does not run over the sides. Allow to dry for an hour. Using the back of a paint brush, colour in the design with Dala Glass Glaze. Work from the outline inwards towards the centre of each section. Apply Glass Glaze liberally but take care not to allow colours to run over outline into next section. Apply Glass Glaze to background, filling all uncovered areas. Allow to dry completely before beginning another side of the box. Follow above steps for each side, repeating same design or using different design for each new side. 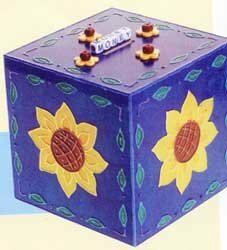 Once all sides have been painted, use Dala Craft Glue Pen to stick beads, buttons or charms of your choice onto your Crafty Money Box. When using Dala’s Glass Artliners, maintain even pressure when drawing outline and hold Artliner at a 45˚ angle at all times in order to have nozzle in full view . It is recommended to draw away from your body and not towards your body.